The world over, us Kiwis are known for our can-do attitude when it comes to almost anything. Our unwillingness to let the thought ‘it cannot be done’ beat us in our conquests has seen many of the world’s greatest inventions, especially in the motorsport and automotive sector, come to fruition. Legendary names from years gone by, the likes of Bruce McLaren, John Brittan, and Possum Bourne, are still recognized as the pinnacle of success and adorn walls of note all over the globe, not just for their driving prowess but for the innovations that they delivered to the world in order to achieve those accolades. We’re pretty lucky in the fact that if we hit a roadblock on the way to achieving what our minds have created, there are talented people waiting for you to pick up the phone and spin a yarn — you wouldn’t be hard-pressed to find at least one person game enough to take on even the craziest of ideas. That’s not to say everything we try always works out, but it’s usually the first step towards an eventual solution that will go on to revolutionize the way things are done. Here in New Zealand, we are very lucky to have that bunch of accomplished and seriously clever people who continue to top the local market with their own innovations, and export them to the rest of the world for the simple reason that they remain unbeaten. Be that leading the charge when it comes to perfecting cylinder-head flow with the likes of Horsepower Heads; locally manufacturing lightweight, strong and cost-effective sequential gearboxes at TT Industries; or producing the keys to building super-tough rotaries, including designs that no one else in the world has been able to replicate, such as those by Precision Engineering — tag along with us as we yarn up a storm with some of our greatest innovators to find out what they offer and how they got there. The Kiwi can-do attitude will lead us to cracking into almost anything ourselves. However, when it comes to the complex art of head porting, there’s a lot that can go wrong and see a good motor turn into a lemon really quickly. 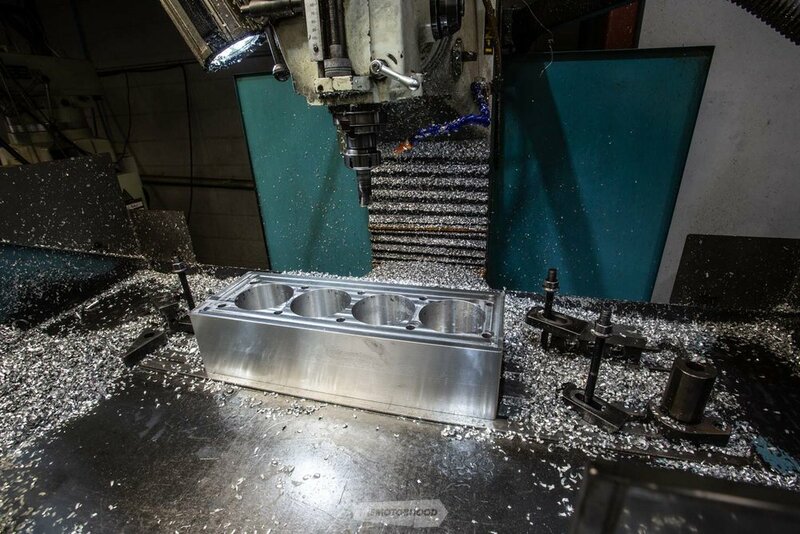 Luckily for us, there’s an innovative local company that specializes in professional CNC cylinder-head porting — Horsepower Heads. Boasting more than 30 years of experience, founder Kevin Ban has been behind countless race wins and national championship titles, here and overseas. It started in the mid ’80s, when Kevin picked up a job at Tauranga Motor Reconditioners and qualified as an automotive machinist. Horsepower Heads was launched in 2016. With a never-say-it-can’t-be-done attitude, the company continually innovates and doesn’t believe in following the pack. This approach has seen its work proven in New Zealand and across the ditch in some of the fastest speedway, drag racing, and Time Attack cars, including the 2017 World Time Attack Challenge (WTAC)–winning MCA Hammerhead S13. Horsepower Heads’ passion lies in supplying world-class products and services to racers — its range of Toyota 1UZ manifolds for Super Stock racing is one good example. It offers CNC porting to suit an ever-expanding range of engines. Programmes are developed in-house to cater for your specific application. Machining is carried out on a Rottler P69 five-axis CNC machining centre that is specifically designed for head porting. If a programme for your engine model is not available, Kevin can create it — first, by using traditional hand-porting methods and flow testing until he’s happy with the result, and then copying it into the CNC machine. “Remember, all the best CNC porting programmes came from years of development through grinding ports by hand!” he says. It’s easy to see why Horsepower Heads is the go-to for high-end head work, both locally and internationally. The company continues to innovate and push the boundaries by staying on top of the game with relentless research and programme development, offering undoubtedly the best services for New Zealand racers that you’ll find here or overseas. Building, or rebuilding, motors when you can still get your hands on parts from the manufacturer is all well and good, until the maker decides to pull the pin and the pieces required become gradually harder and harder to find. This is especially the case when it comes to one of the most sought-after rotary combinations, the 20B, or even in cases when we never had access to the parts in the first place — as with the quad-rotor screamers. Making the components required to enable people to build these motors requires a serious amount of engineering wizardry and know-how, and, while many have tried, almost all have failed to make the components viable, with one notable exception: the current world leader when it comes to producing aftermarket four-rotor and three-rotor short-cranks, a Kiwi-owned and -operated company by the name of Precision Engineering. You’ve probably heard of it before, seeing as its owner, Jeff Bruce, is credited with producing the first four-rotor crank outside of Mazda’s own — that original unit lived inside Bryce McEwan’s ‘FOURRE’ FD RX-7, which was featured back in NZ Performance Car Issue No. 87 from 2004 — and served as the blueprint for every aftermarket four-rotor in existence, which includes those used in Mad Mike Whiddett’s ‘MADBUL’ and ‘HUMBUL’ RX-7s, and ‘RADBUL’ MX-5. Although, as time went on, the quantity of 20B parts began to be whittled away, and, as the unique thicker 20B centre plate (70mm) became harder to obtain, consumers looked towards the aftermarket for solutions. This was where Jeff continued to design and produce three-rotor short-cranks that meant two 13B centre plates (50mm) could be used instead of the 20B’s unique centre plate (70mm). They became hugely popular, and remain one of the most in-demand options that he offers today, along with all the unique internal parts, bar the 70mm centre plate, for the 20B. And it was from his work with these three-rotors that Jeff came up with the idea for his now-famous four-rotor design. He also tells us that even the six-rotor is similar in concept: the same crank with an extra piece on each end. It sounds easy on paper, but the issue is trying to keep it straight, due to the length, when making one: “Keeping things straight is always a challenge,” he says. Although the six-rotor is what Jeff calls a “boutique” motor, with only two complete examples currently in existence: the Pulse Performance Race Engineering (PPRE) RX-4 and an M6 BMW in South Africa. A third, incomplete kit is in Australia. For all of his kits — which include 13B cranks; 20B cranks; three-rotor short-cranks; and, of course, the quad- and six-rotor cranks — nearly all work is completed in-house at Precision Engineering, only outsourcing the more specialized tasks, such as heat treatment. 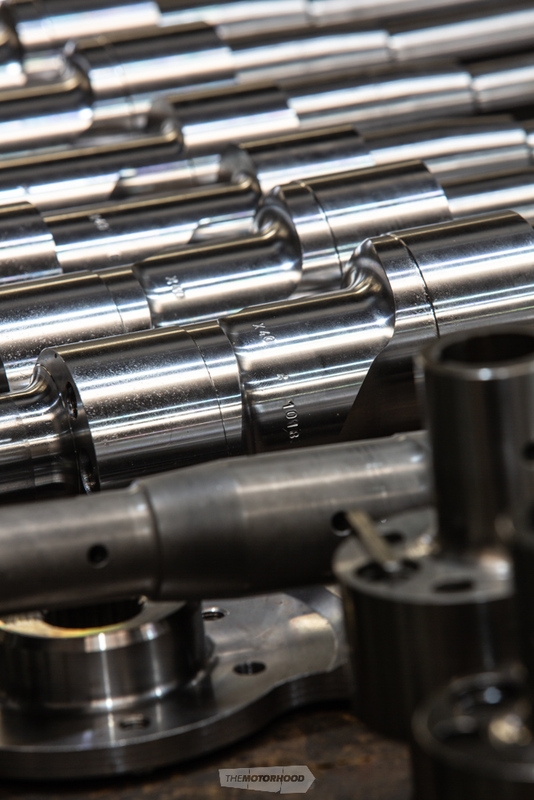 There are currently two types of crank available, an OEM-spec one, which rates roughly 31–32 on the Rockwell hardness scale, and an X40, which is hardened and toughened, suited to the likes of boosted applications, rated to 40 on the Rockwell scale. At the time of writing, Jeff is about to release the next generation, which he’s called ‘X50’, and he says it’s 30 per cent stronger than the X40, handling of boost thrown at it in testing. Precision Engineering remains the only manufacturer of commercially available four- and six-rotor cranks, despite others attempting to reproduce them overseas to no success, and continues to top the world with strengthened 13B, 20B, and three-rotor short-cranks. Precision also produces a range of rotating components — “everything that spins, we make”. Transferring drive to the wheels through the gearbox is one of the most critical points in any power train, not only for the fact that they are the biggest drains on the drive that is being transferred, but also in terms of maintaining long-term reliability without overbearing the chassis with added weight. As the benchmarks of power outputs have continued to creep higher and higher, and factory units failed beyond maintainable levels, drivers and motorsport car builders looked towards the aftermarket for solutions, but, with most performance components, prices were high, weights were heavy to compensate for added strength, and options were limited. Enter Bruce Verdon at TT Industries (TTi), who, after shifting from South Africa and bringing his machine shop with him, set up the company in 2003. Having begun selling these in 2004, they proved to be a huge success among local riders. The internals were completely redesigned with metric bearings, a custom shifting mechanism — the works. When they started to sell rapidly overseas, Bruce switched focus to developing new options: those that could be used in car-based motorsports. TTi imports all its own materials from Germany to ensure a consistently high grade of steel, and all machine work is done in-house at its factory in Nelson, while the casings are cast in Auckland to the company’s specific designs and specifications — making TTi the only New Zealand–designed and –manufactured gearbox producer in the world. The key areas of focus for the products are a low cost for the consumer; reliability and strength; ease of installation; and, of course, being as lightweight as possible. This ethos has seen the products become popular options among the club racers, drifters, and high-end race cars, such as Andy Duffin’s Time Attack FD RX-7. The gearboxes are a ‘generic’ sequential box that can be fitted into many chassis through the use of adaptors and bellhousings. For example, an SR20 conversion uses the original bellhousing, clutch, and throw-out bearing, with an adaptor to bolt everything to the TTi gearbox. 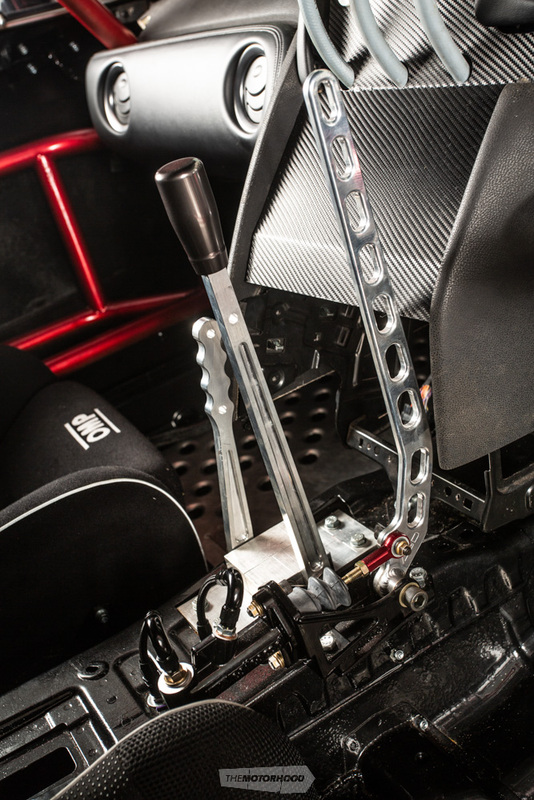 Bruce adds, “It can be supplied with a linkage kit, which allows the gear levers to be mounted to where the drivers want them, where it is a comfortable position for them to shift from, and then the levers engage the levers on the gearbox itself. The TTi gearboxes are available for a massive range of engine and chassis options. Bruce tells us that those used for RB applications were initially the most popular, but there has been a switch to 2JZ applications in more recent times. He is constantly watching current trends to develop the bellhousing and adaptors for anything that hasn’t already been requested, and all the bellhousing and adaptor packages are compatible with the TTi four-, five-, and six-speed gearboxes. They also keep a full stock of spare components on the off chance that you manage to break something or simply to rebuild them back to new in-house at TTi at the end of a race season — a process that sees the designs constantly accessed and scrutinized to ensure optimal performance. So, when it comes to bang-for-buck performance, ease of access, repair, and constant development, you cannot go past what TTi is doing for us locally and the reputation they’ve built for Kiwis overseas.